Thirty years ago Henry "Razor" Sharp (Sylvester Stallone) and Billy "The Kid" McDonnen (Robert DeNiro) were two of the biggest boxers in the game. Each had won a hotly contested bout against the other and in order to decide who the outright champion was a third deciding tie was arranged. However on the eve of the final bout, Razor abruptly throws in the towel, announcing not only his retirement from the sport, but the cancellation of the fight. Thirty years on and time hasn't healed the hate the two has-beens have for each other. Razor is now down on his luck, working in a steel mill and making sculptures from scrap metal. His money worries are not helped by the fact that he has to care for his old trainer (Alan Arkin) who is now in a care home. “The Kid “meanwhile, has become a boozing womaniser who has used his local celebrity to buy a steakhouse and car dealership. Both have spent so much time away from boxing that there not even able to go for a run without nearly having a heart attack. Eventually a promoter (Kevin Hart) arranges for both men to lend their skills to a video-game. When "Kid" ambushes "Razor’s” motion-capture session a fight breaks out that is picked up by an onlooker's phone and immediately becomes an internet smash. Emboldened by the interest and seeing a way of making money Hart arranges for the old foes to re-enter the ring in an event he hypes as "Grudgment Day. What follows is not without its charm as De Niro and Stallone are happy to send up their "Raging Bull" and "Rocky" persona. “The Kid" drinks and does a Jake LaMotta sort of stand-up act in his bar whilst "Razor" is handed a glass full of raw eggs to knock down and cracks, “Fighters still do this? Looks like a lotta cholesterol". Alan Arkin plays the typical feisty old guy which seems to be his trait nowadays whilst Kim Basinger plays the love interest and the real reason behind the boxers loathing of each other. De Niro is quite obviously hamming it up and enjoying doing so but it's Stallone who gives the best performance. He manages to find a way of humanising "Razor" who is a brute of a man who knows that he had talent but let it all slip away. Most of the jokes are either at the expense of people’s weight or age and don't always hit the mark, "The Kids" jokes that are aimed at a lesbian heckler when he is doing his stand-up routine are a bit close to the bone and not for the easily offended. 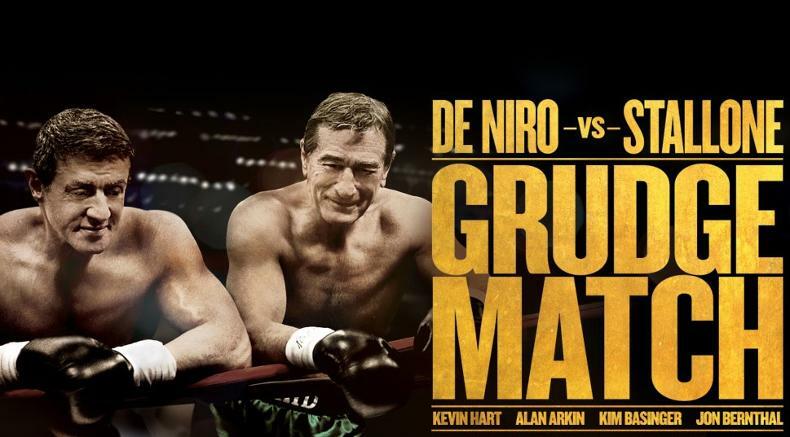 Wither a younger audience will warm to "Grudge Match" is open to debate. However for a generation brought up on De Niro and Stallone in their prime and who liked the recent "Last Vegas" or "Reds 2" this could just be a knockout.